Made in Ultimo, Sydney, New South Wales, Australia, 2001. This model represents the glider designed and flown by George Taylor on 9 December 1909 on the sand dunes at Narrabeen, NSW. He was the first man to fly a heavier than air craft in Australia. Whilst the names of Lawrence Hargrave and Kingsford Smith are well known in Australian aviation history, Taylor has been largely overlooked. Generally more well known is Taylor’s wife, Florence, who was the first woman in Australia to fly on the same day. The full-size glider was a simple biplane with a box kite tail. It had a wingspan of 28 ft (8.5 m) chord of 4 ft 6 ins (1.4 m) and empty weight of 103 pounds (46.7 kg). The spars were made from Oregon, or Douglas Fir as it was then known, and were 14 ft (4.3 m) in length, joined at the centre of the glider. The spars were butted together and held in place with a timber splice, bolted through each spar. The cross section of the spars was trapezoidal, with smooth, rounded edges to avoid tearing the canvas. The front spar formed the leading edge of the wing and was attached to the rear spar by six compression beams, or compression ribs. These were straight pieces of timber bolted to each spar to react with the tensile loads produced by way of internal wire bracing. The compression ribs were constructed from Hickory and separated the spars by about 3 ft (0.9 m). Each bay formed by the spars and struts were wired stays. The wing's aerofoil shape was provided through 42 curved ribs. The two sets of wings were joined by 12 uprights, stanchions or struts. These struts were oval in cross section and numerous spars were required as these were generally the only parts of the glider damaged during heavy landings. The ribs were Silver Spruce and were steam bent into a simple curve. The cross section shape of these ribs was rectangular, with the corners on the upper sides rounded where they came into contact with the fabric covering. The stanchions or struts were of Hickory. The wing surfaces were covered with calico which was dampened and well-stretched prior to the application of a thin coating of linseed oil. Varnish was not be used as it rotted the material. The amount of material required to cover one of the gliders was 40 yards (36.6 m). The wings were identical except for the gap on the lower wing where the pilot stood during take off. 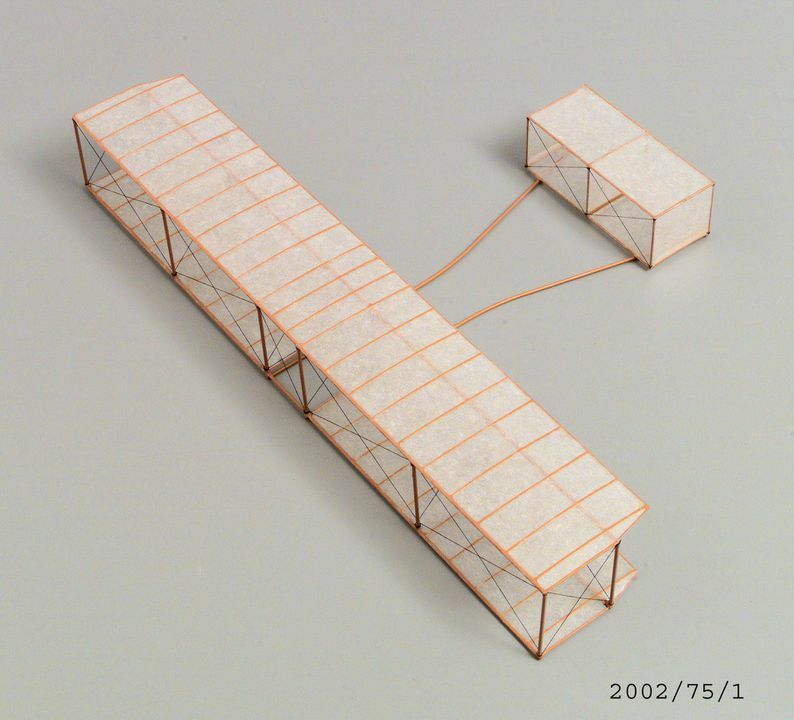 The model of the glider was made from a frame of piano wire. Cotton thread provided the wire struts while the wings were covered with doped tissue paper. George Augustine Taylor was born in Sydney on 1 August 1872. He was a craftsman and journalist and during the course of his life had a number of interests including radio, telephony, martial technology, town planning and labour saving devices in the home. He trained as a builder, worked as a cartoonist in the 1890s and manufactured 'bagasse', a cement-plaster around 1900. Taylor also became interested in town planning and helped to found the Institute of Local Government Engineers of Australasia. George's study of Aeronautics began by him making models of aeroplanes. On 28 April 1909 he called a meeting of like-minded people to discuss the future of aeronautics and was chaired by Lawrence Hargrave. George proposed the formation of the Aerial League of Australia. George Taylor's glider was similar to one designed, built and flown at Neuville sur Saone (Rhone) in France by the Voisin Brothers. That glider had been built in 1899 and featured flat, main wings and a Hargrave box kite tail. The wingspan appeared much shorter than Taylor's 1909 glider. Despite the flurry of activity of importing foreign machines Taylor wanted to see a locally produced aeroplane in the Australian air first. It is also of note that the first man to fly in a heavier than air craft today would not be permitted, for medical reasons, to obtain a pilot's licence. Taylor suffered from Epilepsy. Taylor went on to found the Wireless Institute of New South Wales in 1910, was in the Intelligence Section General Staff in World War I, began publishing "Soldier" in 1916, helped found the Institution of Engineers, Australia in 1919, the Australian Inventions Encouragement Board in 1922 and the Association for Developing Wireless in Australia in 1923. He worked on proto-television, achieving colour transmission in mid 1920s. In 1925 he stopped publication of the "Soldier" magazine and began publication of 'Australian Home". He was also partly responsible for the 1927 Federal royal commission into wireless. Tragically George Taylor died prematurely when he slipped in the bath, struck his head and drowned on 20 February 1928. Florence and George had no children. George Taylor rented premises at 6-8 Brumby Street, Surry Hills which became the first aeroplane factory in Australia and probably the southern hemisphere. At least one glider and one monoplane were built in the Brumby Street factory. "The Sydney Morning Herald" of 2 October 1909 said that the factory was besieged by inventors and eight war kites were apparently under construction. The glider flown by Taylor at Narrabeen was as simple biplane with a box-kit tail made in the factory. The glider model was made by Iain Scott-Stevenson, a model maker at the Powerhouse Museum. This model represents the Taylors' glider which made its first flight on 5 December 1909 at Narrabeen. These flights were true hang gliding as no seats or restraints were used. The pilot leant over the front spar with most of his body weight, hooking his shins over the rear spar. There were about 100 spectators present and a total of twenty-nine flights were made. The preliminary flights were made with four tethering ropes but these were later released. Others who made the flight on the day were Florence, Taylor's wife, and Edward Halstrom, one of Taylor's workers in the aircraft factory. Halstrom went on to establish a refrigeration business and his success ultimately allowed him to indulge in his passions for animals and philanthropy supporting the Taronga Park Zoological Gardens for decades. George Taylor accomplished 110 yards on the first free flight, followed by Edward Halstrom 105 yards and Florence Taylor who flew 90 yards. The other couple who flew that day, were Emma and Charles Schultz on whose North Narrabeen land the flights were made.